Certainly some sectors, like health care, have unique issues influencing their performance. With health care it seems a day does not go by where the headlines focus on pricing issues for generic drugs and drug stocks are then sold by investors. Some of the issues raised may be warranted, but this type of attention seems to heat up during election years. Other sectors like REITs, telecom and consumer staples have the unique characteristic of being comprised of many stocks that pay dividends and growing dividends at that. In this low interest rate environment, the income generating stocks (now some call these stocks bond like equities) have garnered a great deal of investor interest in an effort to replace the income lost on bonds due to low bond yields. The consequence of this chase for yield is many of the dividend paying stocks trade at valuations (P/Es) that are above where they historically trade. Additionally, the P/E divided by the earnings growth rate, or PEG, has also risen to elevated levels as noted in the above chart. A perfect case in point is the utility sector. 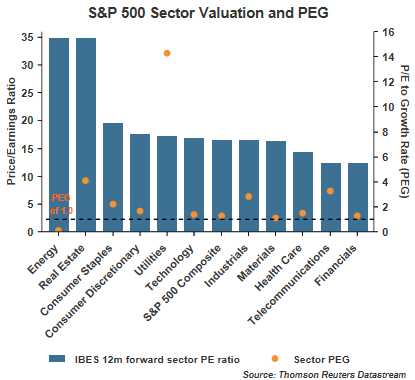 The S&P 500 utility sector P/E is 17 while 2017 calendar year earnings are expected to grow only 1.2% resulting in a PEG of 14. Because these yield-like stocks tend to trade like bonds, as interest rates are increased, the price moves in the opposite direction or down. 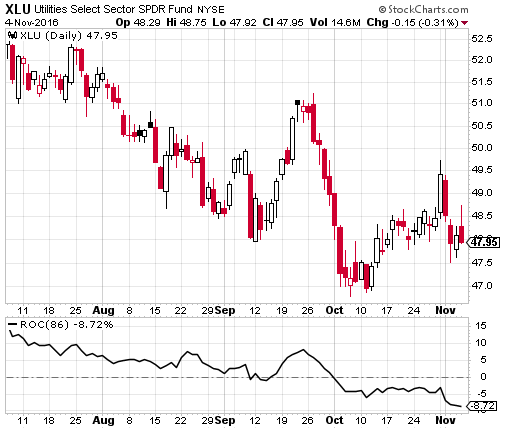 In the first chart above, the utility sector has been a strong performing one in 2016. 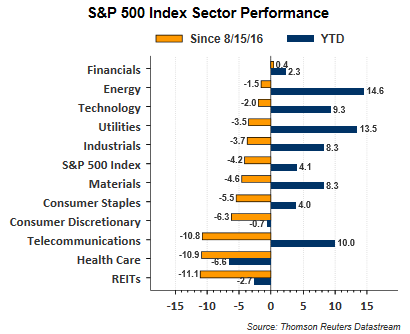 Even since August, the sector has outperformed the S&P 500 Index. Timing can be everything and as the below chart shows, investors that bought utility stocks in early July though may be down nearly 9%. 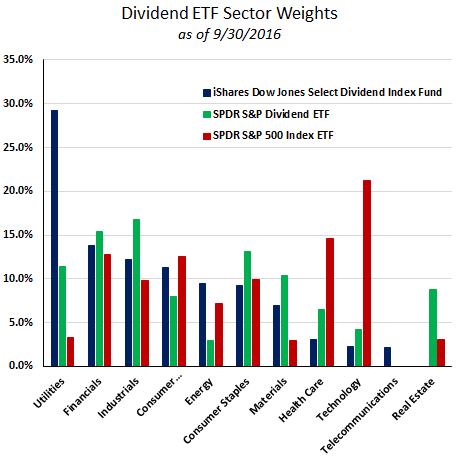 Lastly, investors have the ability to purchase ETFs focused on dividend paying stocks. These index type investments are also underperforming the broader market since the S&P 500 Index high in August. 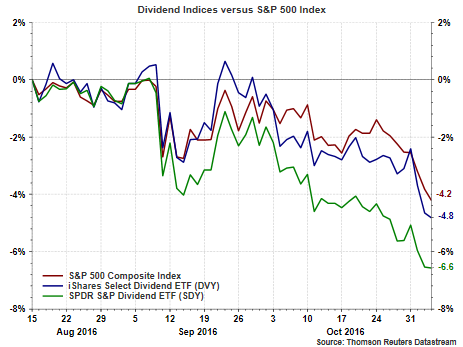 The SPDR S&P Dividend ETF (SDY) attempts to correspond to S&P's High Yield Dividend Aristocrats, the iShares Select Dividend ETF (DVY) invests in company stocks that have a five year record of paying dividends. These ETFs seem like logical investment choices for investors seeking equities that have bond-like attributes with respect to income generation. With the likelihood of a Fed rate increase in December though, the dividend paying stocks have come under selling pressure, and with stretch valuations, they too are underperforming the broader market. As an aside, and an important one, investors interested in these dividend focused products should do their homework in terms of understanding the composition of the ETFs. One important factor investors should be aware of is the varying sector composition between the various ETFs. Below is the sector breakdown of SDY and DVY, along with the S&P 500 Index ETF (SPY). As can be seen, DVY has a high allocation to utility stocks, which has served it well year to date; however, recent weakness in utilities, and maybe more weakness ahead, could be a headwind for DVY's performance. On a long term basis our firm has a bias towards dividend growth stocks due to the insight dividends provide into a firm's cash flow now and cash flow expectations. On the other hand, we believe paying attention to valuations is important, especially in an environment where former bond investors may have been pulled into the dividend payers simply for the dividend yield as a result of low bond rates/yields. The consequence is many of the traditionally safe dividend equities trade at valuations beyond their historical average. With a potential Fed interest rate hike coming in December, some of these once defensive dividend payers and defensive sectors may not be so defensive.